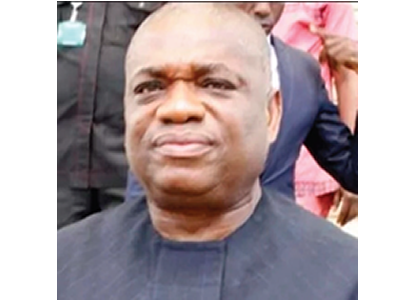 Arguments on the motions for no case submission filed by a former Abia State Governor, Dr. Orji Uzor Kalu and two others against an alleged fraud charge slammed on them by the Economic and Financial Crimes Commission (EFCC) were, yesterday, entertained at the Federal High Court in Lagos. Dr. Kalu and his co-accused had, through their lawyers, filed the motions upon the conclusion of the prosecution’s case. The lawyers, in their arguments, adopted all the paragraphs of their motions and prayed the court to discharge and acquit their clients of all the counts contained in the charge because no prima facie case has been established against them. Responding, EFCC’s lawyer, Rotimi Jacobs (SAN) urged the court to discountenance the submissions of the defence lawyers and directed the defendants to open their defence. After listening to the submissions of parties, the presiding judge, Justice Mohammed Idris, reserved ruling till July 31. In his motion, the former governor argued that the entirety of the evidence of the prosecution witnesses not only woefully bears no relationship with the charge, but also failed to establish any linkage or nexus with him. Contrary to the prosecution’s claims, Kalu maintained that there was no evidence whatsoever or facts leading to any reasonable inference that he in any manner whatsoever ‘procured’ by initiating a proceeding to cause a thing to be done, instigated, contrived, bring about, effect or cause the third defendant (Slok Nig. Ltd) to retain any monies whatsoever in its account from the treasury of Abia State Government. It was disclosed that, “The prosecution, throughout the length and breadth of its case, never led any evidence of any board resolution of the third defendant company to accept any fund whatsoever from the first defendant (Dr. Kalu). “The prosecution also failed to show any instruction whatsoever from the first defendant to the second defendant (Udeh Jones Udeogu) to receive any fund from the treasury of Abia State and no evidence was led to show any instruction or authorization from the first defendant to the second defendant to pay any funds whatsoever to the account of the third defendant.